Fifth Floor is the name of the restaurant at Hotel Palomar in downtown San Francisco. 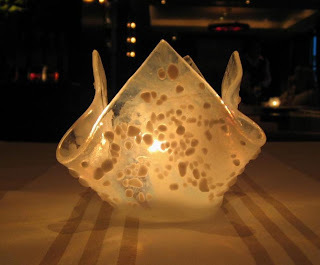 Of particularly interest to me is the fact that this restaurant has continued to maintain its Michelin star even as chefs have changed during the last few years. As for the hotel itself, the Palomar fancies itself as an arty hotel in more ways than one. Categorized as a boutique hotel, this place is known for its wine receptions that bring together wine and art during the evenings. In the evening, I went up to check out the art on display. There was a silent auction going on and the art on display included original drawings and etches from Chagall's stained glass windows in Jerusalem with bid prices starting at $3500. After a while, as the art exhibition wound down, I made my way to the Fifth Floor. Dark wood, luxurious linens, chic chairs and small tea-lights on the table make up the minimalist but elegant decor. Executive Chef Jennie Lorenzo (earlier part of Gordon Ramsay's team), sommelier Emily Wines (! ), and pastry chef Leena Hung are the all-female culinary team behind this fancy restaurant. Women chefs are making their presence known in the Bay Area and the list of starred chefs is not limited to Alice Waters. 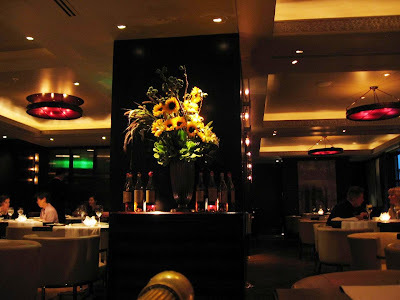 The Fifth Floor serves modern French inspired by the Gascony region of France. 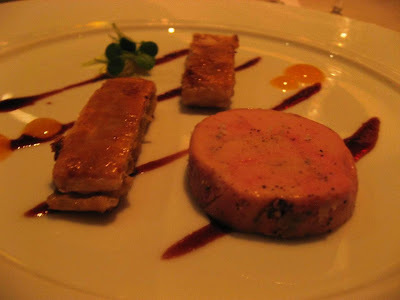 It was obvious I had to begin with the Foie Gras, the most popular delicacy of this region. This was an Artisan foie gras terrine, with kumquat and almond bastilla and a red wine-armagnac gastrique. It was a really tasty dish, silky smooth with a hint of tangy sweetness on the palate. 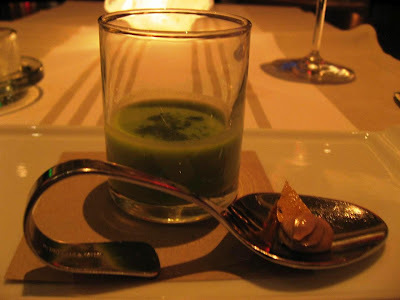 Before the foie gras, they had served a couple of amuse bouches: A cold pea-soup shot along with a spoon of duck liver and cheese thingy that I can't recall too well. 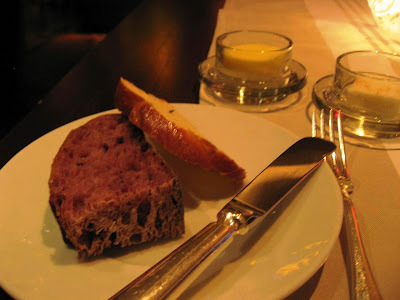 Also, they served up some excellent bread: one was pecan-encrusted multi-grain bread, the other a sweet white livened up by star anise. 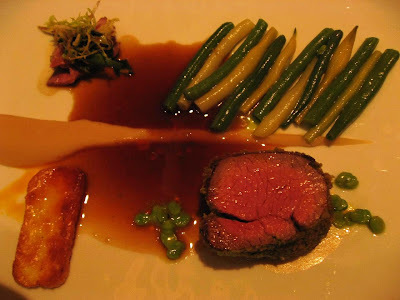 My entree was the L'Agneau, parlsey-crusted loin of lamb, white and green beans, glazed bok choy and eggplant marmalade. I relished the flavors and textures of this dish slowly with the Riesling I had chosen tonight. 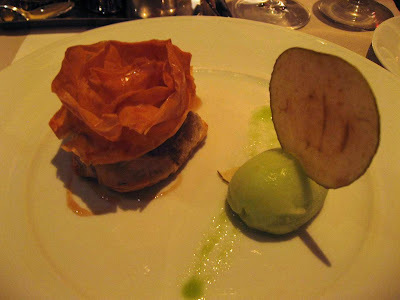 For dessert, I tried the Croustade Gasconne, a version of an apple pie with anise-orange blossom syrup, apple crisp and green apple sorbet. 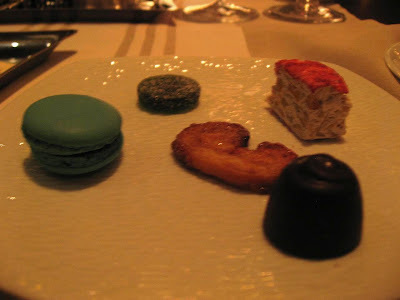 This dessert wasn't particularly memorable for me, but the rest of the dinner had made me quite contended. Another pot of Earl Grey and I was ready to hit the bed. Incidentally, Chef Jennie Lorenzo worked for a little while at my other favorite restaurant nearby, Ame. That's delicate menu I must say. We were in Indus Kitchen this afternoo. Nice one. Thanks for the reference. Which one will you suggest next ? Meanwhile Blogtrotter has moved to another country on its 250th post. Enjoy and have a great Sunday! I do find the atmosphere a bit dark though... I like to see what is in my plate when I eat! @Harekrishnaji: Glad you liked the place. Well, there aren't many new places, but you could try the renovated Flags restaurant (next to INOX). @Final Transit, Trotter: Thank you for being regulars here. @Zhu: Well, I don't mind low lighting. It can enhance the atmosphere sometimes. But it does make photographing the food tricky especially when you don't want to use the flash. So when can we expect posts regarding these Pune eat-outs? I am planning trip to Jadhavgadhi in near future. Classic, elegant and what great servings - I love the fashionable china. @Vijayendra: Thank you! I am scheduled for a working lunch at the new Courtyard by Marriott later this week. BTW, I missed a lunch meeting with A.R.Rehman organized by that hotel because I had to fly out on business earlier this month. @Harekrishnaji: Let us know how it turns out for you. @RennyBA: Thank you. Loved those beautiful pictures of Norway in summer on your blog. Hello, as you may already noticed I'm newbie here.